Cassino, also known as Casino, is an Italian fishing card game for two, three, four (possibly in two partnerships), or even theoretically five players. It is the only one to have penetrated the English-speaking world. First recorded in 1797, it seems to have been heavily elaborated in 19th-century American practice. It is mostly played by two with a standard deck of playing cards, the object of the game being to score 21 points by fishing up cards displayed on the table. 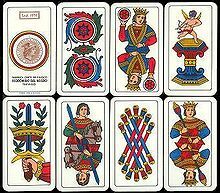 It is very similar to and probably descended from the Italian game Scopa. Trailing: Any card may be discarded face up to the table. Pairing: Any card may be used to take one or more cards of the same number, or a build with the same value, that is face up on the table. Combining: A number card may be used to take two or more cards whose pips total the number on the card being used to take them. For example, a player may take a 3 and a 6 with a 9, or may take a 2, 4, and 4 with a 10. Building: Cards may be built upon in one of two ways (see Building). Players may perform two of the above actions only when pairing and combining simultaneously; e.g. a player may take a 3, a 4 and a 7 with his own seven. Players with builds on the table are limited in the actions they are permitted to make. This is described in more detail below. Face cards do not have a denomination in Cassino and are not available for building. The face-cards may only be paired one at a time; if there are two queens on the table, only one queen can be paired up. This removes the possibility of a so-called "orphan" face card remaining and preventing further sweeps. An ace has a numerical value of 1. Cards are usually left on the table after each player's final hand is exhausted. These cards are given to the last player to take in cards through pairing or combining. It is common for the dealer, if dealt a face-card in the final hand, to hold this until the final play, as they are certain to pair with it. Under the first type of building, a player may lay one card on top of another if their total equals the total of a card in their hand, and announce that the two cards are built to the total. For example, a player may build a 2 onto a 7 and announce "building nine," provided they have a 9 in their hand. The two cards cannot be split up for pairing or combining and are treated as a single nine. Builds of this type may be taken in by any player by pairing. The building player's adversaries may also take in a build by combination, increasing the capturing number; that is, an eight build may be combined with an ace if an adversary holds a nine. Any player may also continue to build on a build, for example, a seven build could be built to nine by a player with a 2 and a 9. The player who originally builds may also re-build, but only if they hold all appropriate cards: they would have to hold both a 7 and a 9 to make the required building steps. Under the second type of building, called "multiple building," "natural building", or "double building," a player may lay one card on top of another if their values are the same, and announce that the two cards are built together. That is, a player can place a 7 on top of another 7, or on top of a 5 and a 2 which have been built to 7, and announce "building sevens," provided that he has a 7 in his hand. The built cards are gathered only with another 7. As with the first build type, a player must hold the card necessary to gather his build for the natural build to be permissible. Importantly, the capturing number of a multiple build can never be changed. An optional rule is that, when building in this manner, players may combine other cards on the table, and build in the first manner. For example, suppose the cards on the table are 2 K 6 5 8, and the player holds a 3 and an 8. They may play their 3 onto the 5 to "build eight" and in the same move "build eights" by gathering the 5-3, the 8, and the 6-2 together onto one pile, taking in all five cards on their next play. Building exists as a means of protecting cards from being captured by adversaries. The first form of building is a weaker form of protection, and primarily protects cards against combination by mid-to-high range cards. Natural building is a much stronger protection, and prevents adversaries from taking cards unless they hold a card of specific face value, one of which the builder already knows resides in their own hand. The value of building decreases significantly as the number of players in the game increases. In a two-player game, one requires only one adversary to be bereft of the necessary cards; in a four-player game, one requires three adversaries to be lacking the necessary cards to steal a build. As such, building effectively in a two-player game can be very advantageous, but in a four-player game is very difficult. Variant 1: a player with a build on the table is not permitted to trail a card until that build has been taken in or rebuilt upon by an adversary; they may, however, pair or continue their "build" with any card on the table. Variant 2: a player with a build on the table is obliged to either take in that build, by pairing or combination, or to add to that build on their next turn. Variant 3: A player with a build on the table cannot trail. Play must initiate from the hand. Continuing a build from only cards on the table is not allowed. You must either take in the build, duplicate it or increase it, OR defer by starting another build or assuming ownership of an opponent's build. A build 'belongs' to the last player that set its value. You may assume ownership of a build started by another by increasing it. But only if it consists of a single combination, i.e., not duplicated. You may have more than one build, but only one of any particular value, and having a build of the same value of another (an adversary's) makes no sense at all. Which variant is used changes the tactics, particularly in a two-player game. Under variant 1, the builder has a profound advantage; if they know that their adversary lacks the cards necessary to steal their build, they can often take several cards trailed by their adversary before taking in their build at the end of the round. Variant 2 allows the adversary to trail a card they wish to subsequently capture without the risk of it being taken, reducing the builder's advantage. In one two-player variation, a player can call for a game to be concluded once they are convinced they hold sufficient cards to bring their score to 21; if they do have 21 points, they win regardless of their adversary's score; if they do not have 21 points, their adversary wins. If one player has won the entire 11 points, some rules state that this player will be awarded an extra point for 12 total points in the round. Other rules state that this is a "skunk" if it occurs in the first round, and therefore that player wins. In other variations, taking all traditional 11 points in a single round is an automatic win, no matter when it occurs. A sweep is declared by a player who manages to capture all face-up cards from the table. In some localities, each sweep is worth an additional point. The opponent has no move except to trail, and a follow-on sweep may result. Points for sweeps are awarded after the base 11 points, in the event that two players reach 21 in the same round. In another variation, trailing the five of spades sweeps the table, the sweep giving one point. There is a variation in which sweeps are scored as they occur; if the sweeper had 20 points (or more, due to a tie score), the sweep would end the round instantly. A scoring variation in which each point card is scored as it is captured also exists. In a variation devised in Michigan, a player who defaults on his duty after building gives up 2 points at the time of the violation. This is sometimes an acceptable cost to trap cards from the other player in builds the player cannot take. Sweeps also score 2 points. In a series of "rounds to 5," any three instant scores (sweeps or defaults) against the same player ends the round. These sudden-death variations make short-term tactics more important in certain situations than the longer-term goal of achieving the high score for the round. In some regions, all four face-cards of the same rank may be gathered simultaneously. This allows natural building with face-cards, while still removing the possibility of an "orphan" card. However, this provides no particular advantage if all four face cards are shared between one player and the table, as is necessary to build in such a manner. Any pairs dealt to the table at the start of the round may be automatically granted to the first player to move, regardless of whether or not that player has a card to capture them. These cards cannot be built upon, but multiple pairs may constitute an automatic sweep if the table is cleared this way. This rule variation is intended to counteract the advantage of later players' ability to poach or modify builds started by the first player, by awarding extra points at the start. Five-player Cassino can be played by removing the deuces of hearts, diamonds and clubs, and by giving an extra card to each player on the last deal. In Royal Cassino, face cards are given number values upon which building may occur: jacks count as 11, queens as 12, kings as 13. For example, a player could combine a jack and a two with a king, since 11+2=13, and all applicable building laws remain. An Ace is 1 or 14, the player's choice. If trailed, it is not yet determined. If not, it is fixed. There are no 'Face Cards'. Sweeps do not count. The total points is always 11. You may play to 6 or 21. Ties are possible if no one has the majority of spades, broken by another hand played for 6. In Buckeye Cassino, all rules of Royal Cassino are inherited. In addition, the ten of diamonds ('Big Ten') holds two values: ten and eleven, poking fun at college basketball's Big Ten Conference, which then consisted of 11 teams. In the Trailing-royals Cassino variant, orphaned face cards are not considered a problem. Face cards may be naturally built or paired in any way, so a player may gather three of the same face card simultaneously. The remaining face card will be an orphan, because there is no card left with which to capture it. Such cards remain on the table until the end of the round, and are taken by whoever performed the final capture, as are all other cards left on the table. This method of play does not pair well with the preceding variant that rewards sweeps, because having orphaned cards on the table prevents sweeps. Point cards cannot be plucked - so plucking excludes A's, big casino (10 of diamonds) and little casino (2 of spades). Plucking cannot be done when there is only one card left on the table i.e. causing a sweep with a pluck is disallowed. Plucking cannot be used to get the last trick of the round (after the deal pile is exhausted). Players are not allowed to pluck a card they just played on the same turn. The first player/ team to reach 31 points or more is declared the winner. If both players/teams finish the round with 26 cards each, the player/team with the most spades is awarded the points for most cards. California Cassino is a variation for two, three, four or six players, played with a standard deck of cards. The object is to score the most points through acquiring certain cards or by acquiring a certain number of cards. Laying: Any card need to be discarded face up to the table. Pairing: Any card need to be use to take another card of the same rank, or a build with the same value (to know what the build is, please continue reading). Adding: A number card need to be used to take two or more cards whose rank total the number on the card being used to take them. For example: a player needs to take a 2 and a 5 with a 7, or may take a 2, 4, and 4 with a 10. Building: Cards need to be placed upon one another to draw a new value on the table. The way for this way is listed below. Face cards don't have a denomination and are not available for combining or building, though multiple face cards can be paired simultaneously. For example, if a player has a queen in their hand and two queens lie on the table, that player can acquire all three queens. While other forms of cassino use "sweeps," a point for clearing the table, California Cassino prohibits points based on sweeps. Cards are usually left on the table after each player's final hand is exhausted. These cards are given to the last player to take in cards through pairing or combining. There are 11 points to be won in each round. If "most cards" or "most spades" are held by two or more players, no points are awarded in those respective categories. The number of rounds played is determined by the number of players present. Each player must deal twice in a complete match, so if there are 3 players, then there are 6 rounds of play. At the end of the 6 rounds - the player with the highest score is the winner. Diamond Cassino is a variant of Cassino which is similar to standard Cassino, but it is not played with the picture cards. It is, therefore, played with a forty-card pack. Players are dealt three cards each, and four cards are dealt to the table; these are the cards which the players aim to capture. In this game, players get points if they capture all aces, and extra points if they capture the seven of diamonds. Diamond Cassino has been described as an Italo-American version of Scopone. In this game, each player is dealt three cards, and five are dealt to the table. Players may trail or take cards from the table, if they have cards which match the cards on the table, or if they have two cards which add up to a card on the table and equal the table card's value. In this game, Jacks are worth eleven points, Queens are worth twelve points and Kings are worth thirteen points. Game ends when a player finally clears all the cards from the table. (SOURCE: The Penguin Book of Card Games). Tablanette is said to be of Russian provenance. In this game, each player has six cards, and a player with a jack may use it to clear the whole table. At the end of a round, players score points for holding the most cards, and extra points if they are holding picture cards. In Spade Cassino, players are awarded two points for gathering the jack of spades, and one point for each additional spade, in addition to the one point awarded to the player with the most spades. This lifts the number of points awarded in one round to 25. A game of Spade Cassino is usually played to 61. In Draw Cassino, players draw a replacement card each time they make a play, so that they always have four cards in hand (until the end), rather than being dealt cards in discrete rounds of four. ^ "Rules of Card Games: Casino". www.pagat.com. Retrieved 6 February 2019. ^ The Penguin Book of Card Games (Penguin, 1979). This page was last edited on 6 February 2019, at 01:16 (UTC).